As part of the GoSaMo campaign, local businesses will be encouraged to put decals in their store windows to show customers and passersby the nearest transit option (all images courtesy of the city of Santa Monica). Santa Monica is an embarrassment of riches in many ways. That is especially true when it comes to alternatives to driving everywhere. 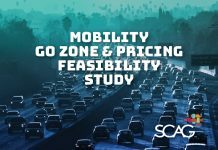 And now, the city wants to make it as easy as possible for you to discover how you can go multimodal and take advantage of Santa Monica’s growing network of transportation options. 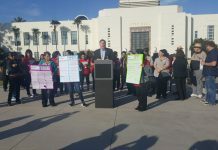 “It was our goal to make integration between our existing transportation networks seamless with the arrival of Expo,” Santa Monica Mayor Tony Vazquez said in a press release issued Wednesday announcing the launch of the city’s “GoSaMo” initiative. Maps on the GoSaMo website show visitors what is in the vicinity of the Expo stations and how long it takes to get to the various local businesses by bus, bike, or walking. “To really address mobility, it had to be about so much more than Expo. 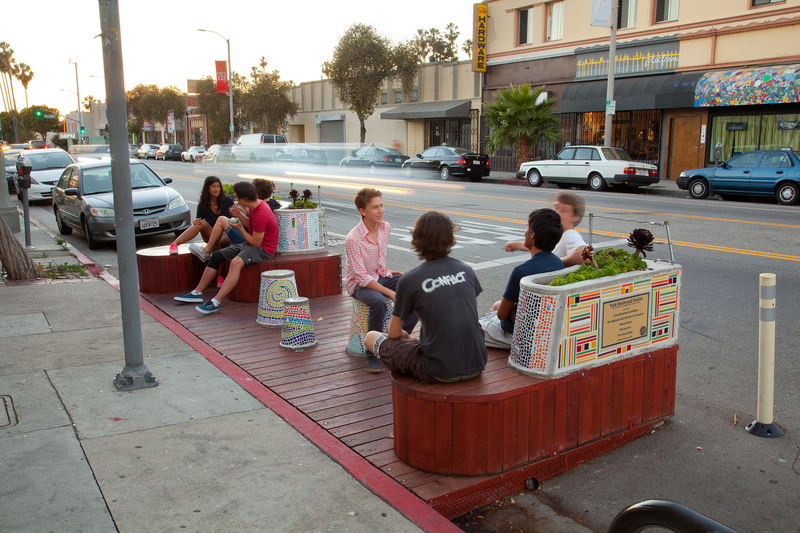 We want to make Santa Monica the leading example of pedestrian and transit-oriented lifestyles in Southern California,” he said. 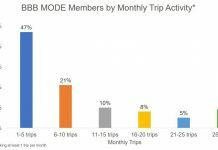 GoSaMo is a multipronged approach designed to get people educated about and interested in the variety of transportation options available to them in the city of Santa Monica. 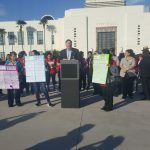 The launch of the initiative is happening concurrently with perhaps one of the biggest changes to transportation on the Westside since the I-10 freeway opened about a half-century ago: the grand opening of the Expo line extension to Downtown Santa Monica. The 6.6-mile extension of the light rail, which opens on May 20, will bring passenger trains back to the Westside for the first time since 1953 and there has been plenty of attention paid to the historic moment. 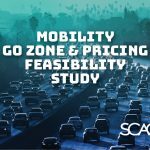 “GoSaMo highlights and raises awareness about Santa Monica’s expanded mobility options—three Expo Light Rail stations, six new Big Blue Bus routes on top of its seven Rapid Bus lines, 75 Breeze Bike Share stations, 107 miles of bikeways, 12 new all-way [scramble] crosswalks, new Zipcar additions, and the Colorado Esplanade opening on June 5th in conjunction with the city’s first open streets event, Coast — presented by Metro,” staff said. Santa Monica’s Strategic Planning and Transportation Manager Francie Stefan put it succinctly at a morning meeting with community members Wednesday: “It’s about options,” she said. With so much recently in the media about parking near transit stations, it’s really refreshing to see the city making such an aggressive effort to make sure people understand that there are other ways to get to Expo or even just around Santa Monica. 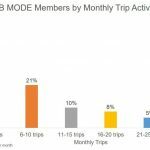 Santa Monica launched the first bike-share system in L.A. County last year, recently adopted an aggressive Pedestrian Action Plan that puts the safety of people walking at the center of street planning decisions, entered into an agreement with Zipcar to make car-share more available throughout the city, and is continuing to grow its network of bike lanes and other infrastructure. 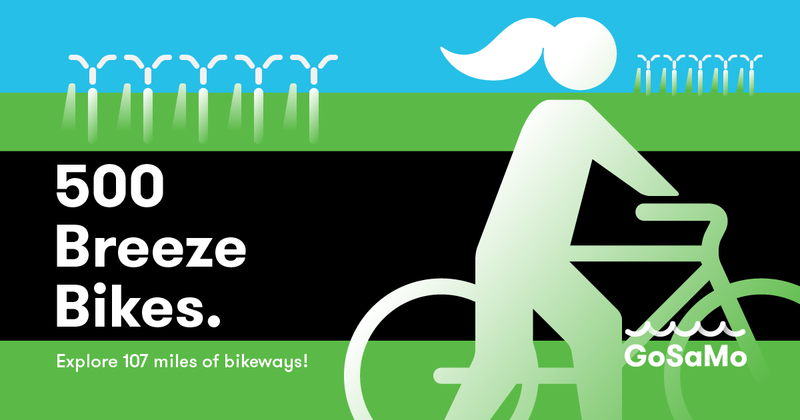 One of the “10 Things to Know” in the campaign highlighting information about multimodal transportation in Santa Monica. You’ll probably see these popping up in your Facebook feed soon. To help with the effort, the city just launched a new website: smgov.net/gosamo. There, people can find a variety of smartphone apps to help them with their commute. Visitors to the site will also see a list of upcoming events and specials, like the free rides on Expo starting Friday, May 20 at noon and continuing through Saturday, May 21. 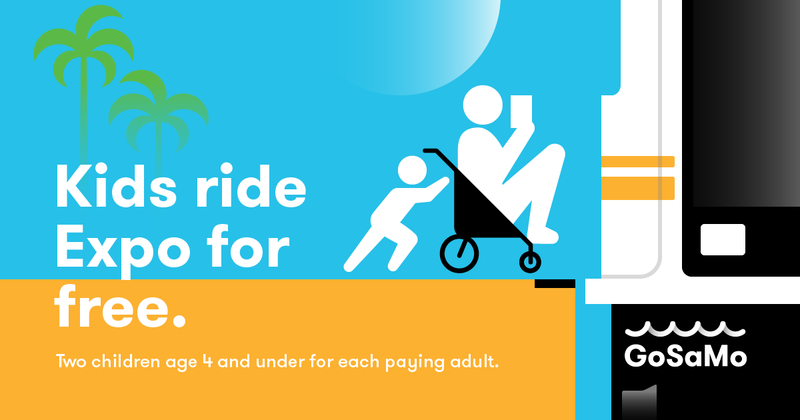 Big Blue Bus is also offering free rides on Saturday and people will be able to test out Breeze Bike Share for free from May 19 through May 21. 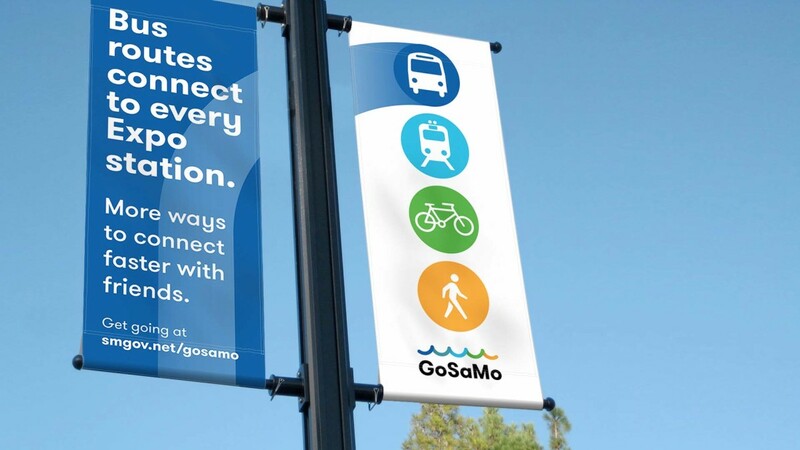 GoSaMo is also being advertised around town on the Big Blue Bus and on lightpoles. 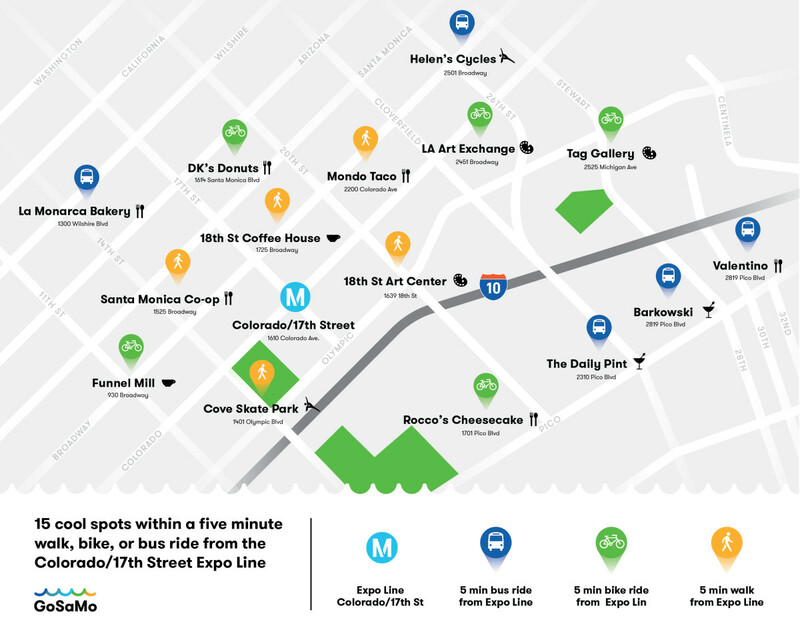 On the website, people can also see maps of local businesses surrounding the Expo stations in Santa Monica complete with how long it would take to walk, bike, or bus to them from each station. There will be a digital advertising campaign with “10 Things to Know” about going multimodal, designed to inform people with simple imagery about their options. Outreach is not limited to the digital world, either. City officials said that GoSaMo will have a “pop-up mobility kiosk” that will make the rounds throughout the city. At the kiosk, people will have the opportunity to ask questions and receive free TAP cards, since, officials said, surveys revealed that not having a TAP card is one of the major barriers people cite for not trying transit options. You can also expect to see photo booths popping up near transit stations where people can share their “Why I Ride” story through pictures. There will be ads on the Big Blue Bus and on light poles around the city. Then there are plans for an ambassador program, through which locals can volunteer to help introduce their friends and neighbors to the options that are available to them. 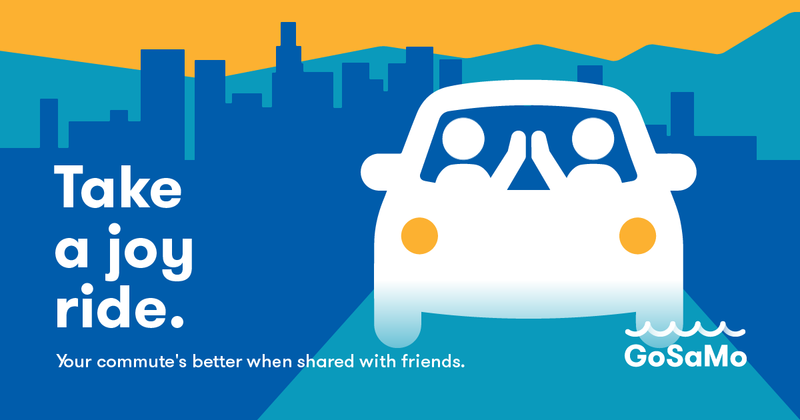 Encouraging carpooling is another part of the the GoSaMo strategy. 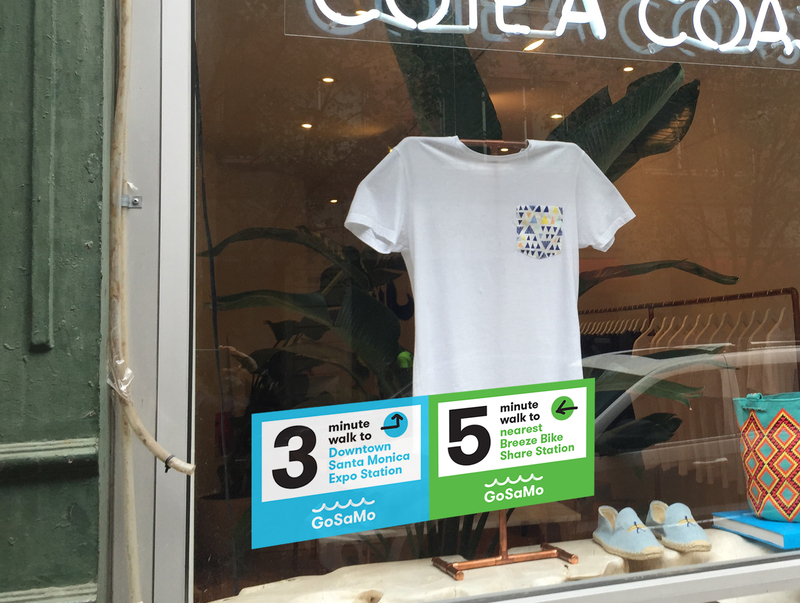 And there will also be a program in which local businesses will be encouraged to display window stickers that indicate how far (in minutes walking) and in which direction their business is from the nearest bus stop, bike-share station, or train station. Officials will also be engaging with local employers around a Car Free Friday initiative, which will aim to have major employers in the city encourage their employees to get to work by bike, bus, train, or carpool every Friday. 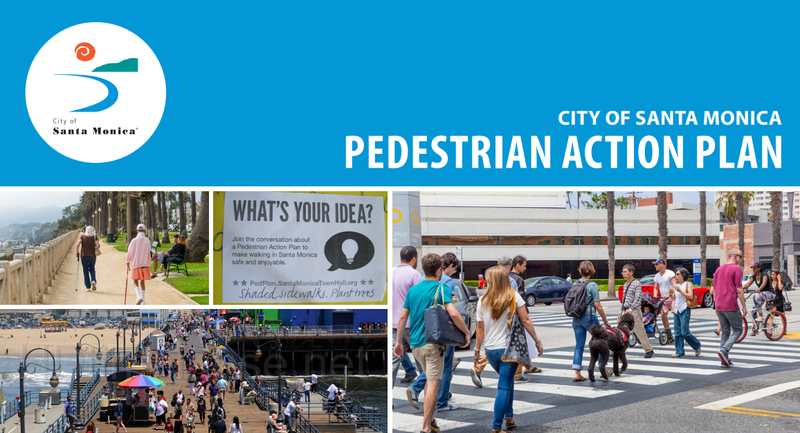 City officials also noted that they will be looking into public “Try-athalon” events, a play on words meant to relay that the events are about getting people to try new options. Officials said that the “Try-athalons” would be themed tours that use different transit modes available in the city. 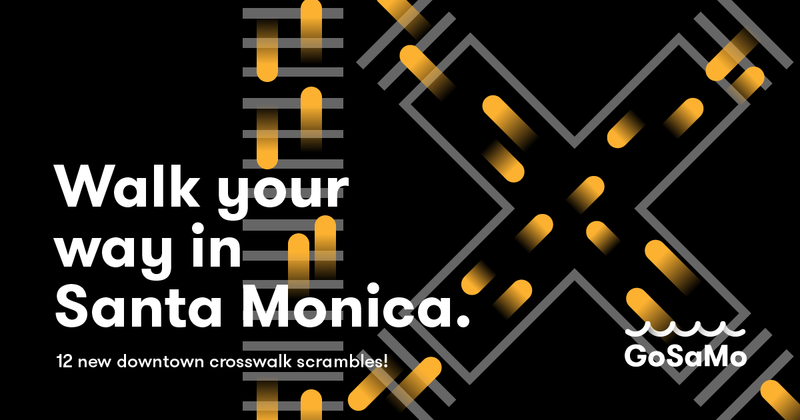 Santa Monica will be getting 12 scramble crossings in and around the downtown, greatly increasing pedestrian safety. 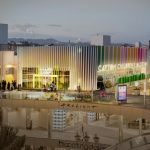 According to officials, the city is working closely with GOOD — a global media company and creative studio — on the GoSaMo initiative. 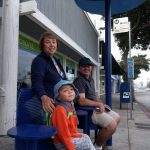 Transit is good for families, too. GoSaMo will be ongoing for the next couple of months. 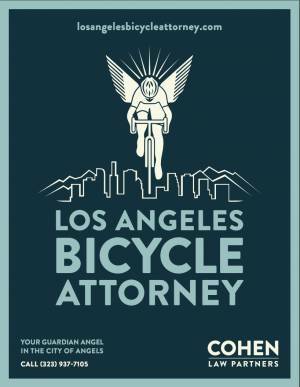 Let’s see how effective it is; here’s hoping it can change some people’s thinking about getting around their community. 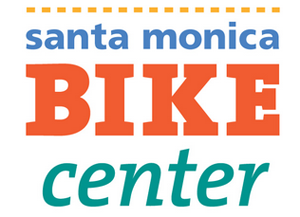 What Will Santa Monica’s New Bike Share System Cost to Use?